Get your Depends undergarments ready, because believe me this is something worth wetting your pants over. IDW's Rocketeer anthology, G.I. Joe revamp and flood of Transformers books all step aside in July, for this little gem; Walter Simonson's Thor: Artists Edition. Following on from last years inaugural Artist Edition, which saw Dave Stevens' Rocketeer saga reprinted from the original art at the same size it was drawn, IDW represents one of the greatest creative-character combos in the history of the medium, like never before. 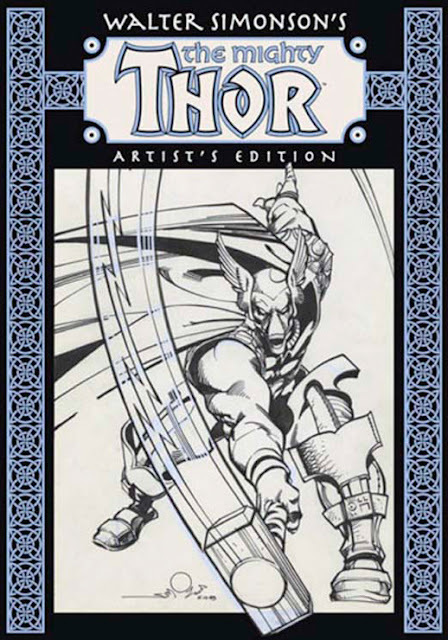 Thanks to Marvel Comics, this 'Artists Edition' will reproduce Simonson's personal original art to represent The Mighty Thor #337-340 (his first story arc) and #360-362 (one of his favourites). Better yet with each page scanned in colour, you get a behind-the-scenes glimpse at how corrections and blue pencils etc were used in the likes of the first appearance of current Annihilator; Beta Ray Bill. Paper stock close to that on which it all was drawn and printed at that same size, the only downside to this collectors dream? The 75 dollar price tag (which translated into kiwi dollars is almost a heart attack waiting to happen). Still if the birthday fairy is reading this blog - Walter Simonson's Thor: Artist Edition would be the ultimate place to start shopping. For IDW's full July Solicitations, click the jump.